Response from Lennart Jarlevang/Sweden on a dAppolito set-up from JA8008/Aurum Cantus ribbon  and some to-come 15-18 bass drivers. 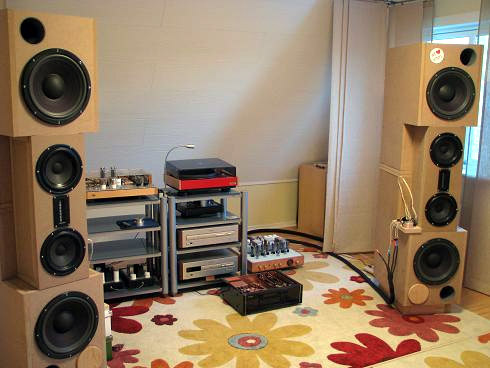 A gigantic system having ~100 dB sensitivity. Lennart, thanks for your response. I'm pleased the JA8008 driver seems to work out and will find its way into a multitude of applications. This was my intention as can be read from the JA8008 website. 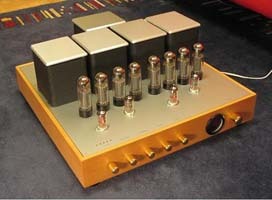 And I'm excited to hear what the future will bring from your 40 wpc SEPP amplifier. Indeed an exiting project too. Regards, Troels. I have listened only a couple of evenings but want to report that I find the JA8008s no less than fantastic. Never before have I experienced such clarity from a pair of speakers. What strikes me first is a natural, organic continuity in the resolution and a spatial sensation presenting a soundstage seemingly without borders. Secondly, the level of intermodulation distortion offered sets low intermodulation at a new standard for me. Really stunning. Its interesting to find that vocal artists played this far are clearly located in front of the other instruments on stage  presumably due to the lack of the bass drivers. 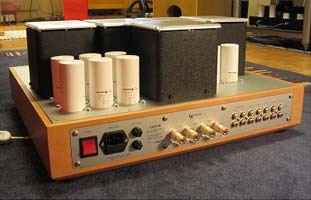 With an f3 of 130 Hz the musical foundation is completely absent  with absolutely no damage to the soundstage. 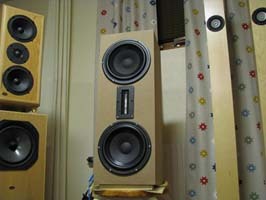 The midrange is unexpectedly complete and does what it is supposed to do without the bass drivers. 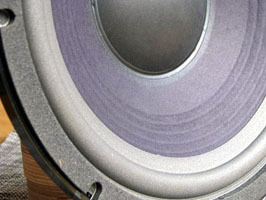 The low-end roll-off at approximately 10 dB/octave still allows for information from the bottom octaves, and the bass kind of slowly disappears beyond the speakers. Very appealing and quite special. Diana Krall is a nice singer with immense musicality and a big voice. She usually sings close to the microphone bringing us really close to her vocal chords and breathing. She is presented with an almost palpable appearance. The phrasing of her voice provides an intimate credibility giving the musical event real live feeling. Behind her voice a pitch black silence, except for her musicians, of course. Her voice is presented with a live feeling that becomes almost thrilling. Microdynamics are surprising. Every change in the vocal expression, power or depth is immediate and, again, surprising. Also Cajsa-Stina Åkerström is a magnificent singer. She too has a dark tone to her voice, which brings richness and physical character to the presentation. Listening to her on these speakers I discovered she has a special end to her r sounds, something I previously didnt notice. Claes Janson has a clear and strong voice. His body is quite obvious in the presentation, his voice has deepness and power to fill out the speakers and add to the already amazing credibility. His crescendos make you jump if youre not prepared for them. Claes presents very fine interpretations of Nils Ferlin and Cornelis Vreeswijk and the listening experience is again strengthened by awesome dynamics. Heather Nova has a rather own character to her voice and singing. She sometimes adds a high-frequency vibrato to her tones and, if one listens carefully, a dry timbre can be discerned behind her voice, rather subtle, resembling the kind of timbre heard when a violin is played with the bow on edge. Impressive. 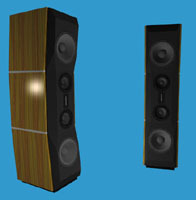 The JA-8008s have offered an exceptional experience with their midrange presentation. My test boxes are designed for a lower f3 at 130 Hz, and I meet the four-inch ribbons with simple second-order (electrically) filters at 4 kHz. Thus, I try to use as large a range as possible from the JA-8008s and at the same time move away from the ribbon resonance. The mechanical quality of these drivers is exceptional. Frequency and phase responses may be a tad un-straight in the upper end as found in measurement, but I really fail to hear it; Id say its inaudible. I invited a friend to listen and asked him to help me find the transition from cone to ribbon. We both failed, however, to identify any audible transition, which may indicate that the JA-8008 cone can match even a ribbon without too much effort. It goes without saying that the above experience is based on the JA-8008s playing together with the ribbons, but my brief experience with JA-8008 is indeed encouraging. Ill definitely keep exploring its interesting capabilities. Thank you for providing this driver just when I needed it! 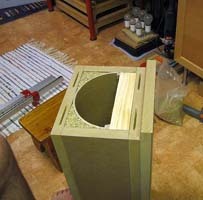 My previous report summarizes the very positive experience with the JA-8008 and ribbon tweeter combination. Two years of extensive listening, measurement and tuning have not only verified my first impressions, but also encouraged me to pursue constructing the matching bass cabinets. 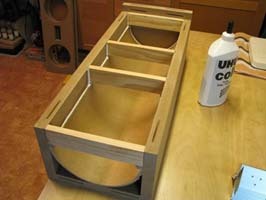 I have spent considerable time trying to integrate the midrange and tweeter drivers. 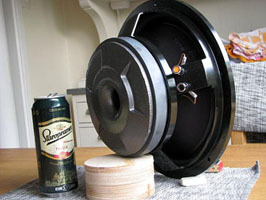 Considering the rather high  for an 8 driver  crossover frequency of 4 kHz, the seamless integration offers quite a challenge. Listening results are, however, indeed very promising. As a bonus, I have learned quite a few things about front baffle geometry and diffraction phenomena. My prime objective has been to mimic the extraordinary performance of the JA-8008 well into the bass region. Thus, I want the bass range to be reproduced as trustworthy as possible; I want it to deliver a dry, resonance free, fast, convincing and live-like low end. Several sessions during the last six months, with listeners of varying experience and skills, have considered this a very homogeneous speaker with extraordinary integration and timing. Fundamentals of bass notes have their harmonics very well timed in the mid range. Several of my friends, being active musicians and singers, have not only commented on their life-like sound experience, but also on the musical qualities of the presentation. The most usual spontaneous reaction is about how extremely well the midrange is reproduced. 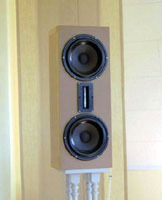 To me, this is one of the key properties of a loudspeaker, and Im very happy to share great listening reports confirming the no less than stunning JA-8008 performance. 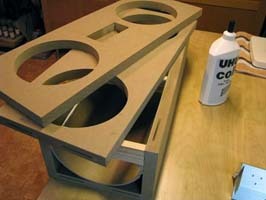 Obviously, the above picture shows prototype casings built for development and verification. 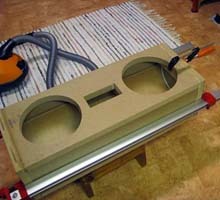 When the design is finalized they will of course be professionally manufactured.